I reiterate what I said before regarding these caricatures. 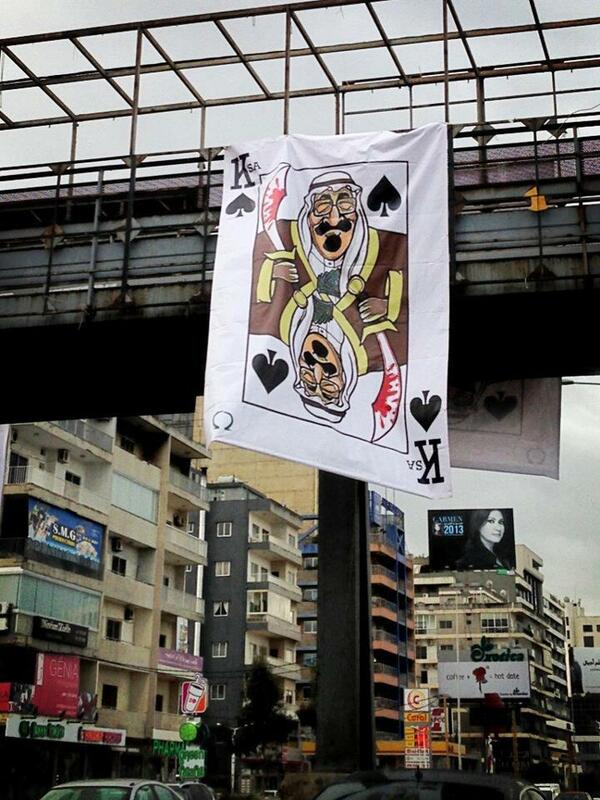 I don’t care about the content of the caricatures: Bechara Al Raï is not a holy figure. I care about the source of the caricatures – Al Watan and Al Jazeera are of the same mold. If these caricatures came from a country where freedom of speech reigns supreme, I would have accepted them without any hesitation. I’d have made posters out of them. These caricatures originate from countries that have no freedom of speech, next to no liberties and are only functional because of the copious amounts of oil beneath their soil. The publications in such countries do not get the right to exert their freedom of speech on me when they have countless problems in their own backyard that could be discussed. Seeing as these publications’ corresponding governments have supreme control over what appears in them, it wouldn’t be far fetched to assume this has also passed through the approval of relevant authorities. It’s not because we have to worry about our expats. It’s not because we have to worry about the Saudis coming for tourism. It’s simply because their low level of discourse does not even warrant the effort put into that poster. Now let’s await a new poster for the Qatari prince and then Qatar will definitely act out all hormonal and threaten to kick all the expats out of its land because its ego was bruised. I don’t believe Bechara al Raï’s visit to Syria was the devil incarnated as many seem to believe. He simply went there to hold Mass, believing his visit would actually get the Maronites of Syria to relax about their future. But it’s not all peachy. His visit is most probably not on his own accord. Odds are the Vatican had requested he visit Syria but I think Al Raï was more than itching to go down in history as the first Maronite Patriarch to visit Syria post Lebanon’s independence. The visit, in my opinion, is absolutely miscalculated and, if anything, showcases a seriously short foresight on his behalf as well – one that a person in his tenure should not have. Al Raï was simply too limited to see the repercussions of such a visit. The hidden meaning is far more serious than it being a simple religious visit. The Syrian regime has, over more than 20 years, systematically persecuted the Maronites of Lebanon, be it politically or demographically or even socially. The Maronite Church stood against the regime countless times, effectively being the first catalyst that led to the regime’s army departing from Lebanon on April 26th, 2005. Bechara Al Raï’s stances have been far removed from the Maronite Church’s historical views towards the Assad regime. But how can a patriarch truly expect the first Maronite Patriarchal visit to Syria since 1943 be considered as a shallow affair of prayer seeing as it is visiting the country of a regime who did what it did to Lebanon’s Maronites? His visit was not to the regime, granted. But in a way, it is by extension. The Maronites of Syria sure deserve their patriarch to visit them – but not under current circumstances. The argument that Maronites all around the world deserve a patriarchal visit is something that the patriarch shouldn’t even touch to justify him going to Damascus. There are also Maronites in Israel. But that part is taboo. Someone forgot to tune in during last week’s Maronite road barricades in support of the Lebanese army. So it’s not really beneath us as Maronites to block roads. After all, it is in these days. 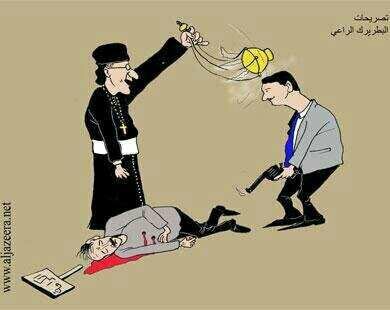 The Caricature in Al Watan newspaper is definitely not acceptable but it’s not because it’s demeaning and offensive to Christianity. Al Watan newspaper did not, similarly to Danish newspapers, publish offensive pictures of holy Christian figures in order for the comparison between potential Maronite reactions, or lack thereof, and Muslim reactions to be valid. Pretending as if this is the same caliber as the Muslim reactions to the prophet drawings, which in themselves were not acceptable, is quite frankly very silly. 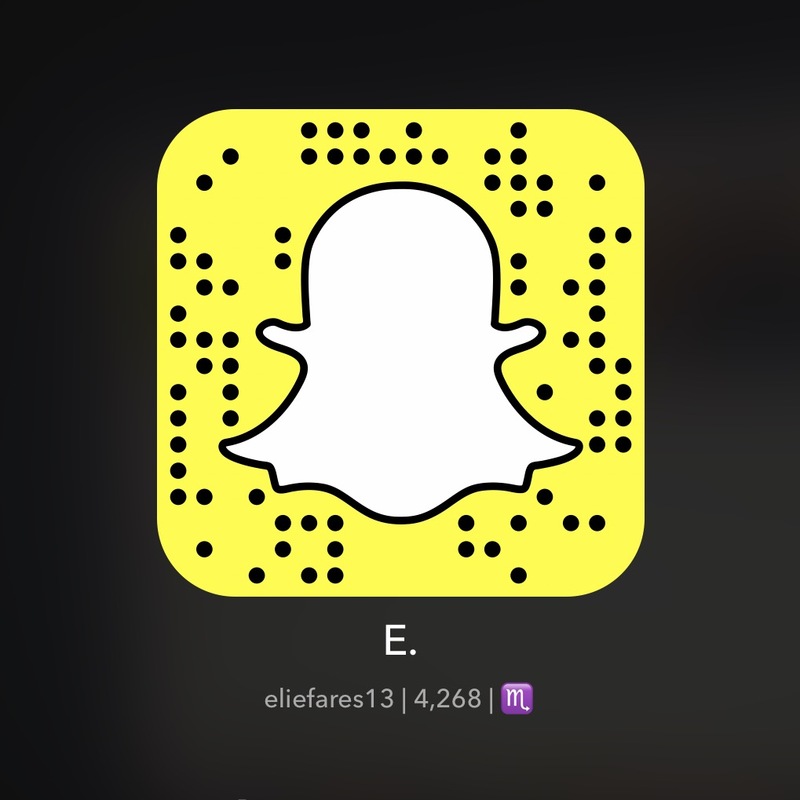 Patriarch Bechara el Raï is not Jesus. He is not a Holy person. He is a neo-politician-priest who did what many believe is a mistake. And it stops at that. But it is not acceptable in any way whatsoever for a disgusting newspaper, Al Watan, which is published in a country like Saudi Arabia where freedom of speech does not exist, where they cannot – nor do they dare – criticize their own religious folk and their ruling class after which their country was named, where Christians are not allowed to practice their religion freely (even the Cross in the caricature was hidden), where women are kept on a leash, where liberties are suppressed and where human rights are unheard of to remotely have the right to criticize anyone in that way, let alone someone who does not affect their country in any way whatsoever. I have to wonder, in what way does Al Raï’s visit to Syria bother Al Watan? It only shows exactly how silly that newspaper is – that they’d go after a religious figure who is probably unknown to the majority of Saudis just because he is one of the few religious figures in the region which they can attack. And it’s not because they hate Christians, as many seem to believe, which I would suppose might hold some truth. It’s because it gives them the illusion that they are free, that they can do this and face no repercussions. They thought wrong. If this caricature had come out from a newspaper in a country known for its freedom of speech, such as Denmark – a place which dared to publish Mohammad caricatures – the discussion would have been totally different. 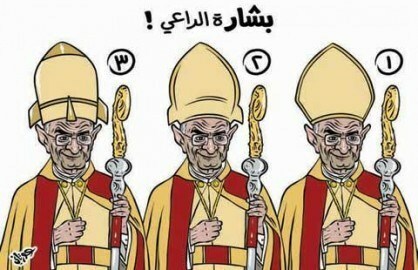 If the pope receives such caricatures, then why not Raï? But Al Watan, with the demented theocratical country it operates in, publishing them is not and should not be tolerated. They only practice their freedom of speech when their bosses approve. When it doesn’t get on the nerves of its readers… when they address a population which lives far away in an issue that does not affect them in any way whatsoever. They don’t dare to see that their own society has a multitude of issues that could be made into a caricature, starting with that sheikh who beat and abused his 6 year old daughter to death to the fact that women are now starting to learn how to drive after their gender has been voting for more than several decades in countries around the world. And that makes them cowards. It makes them not respectable as a publication or a newspaper or any form of media that wants to be read. The best place for Al Watan is the trash bin. Now let’s address our own Lebanese. The Lebanese reactions towards the Saudi insult have not been much better although a Lebanese addressing the issue is definitely more acceptable than someone who comes from a country that doesn’t even know freedom of religion. The caricature, the visit and everything around it was milked politically like everything in the country nowadays. Anything that revolves in any way around defending Christians in this country serves as ammo for politicians from both sides to fire at each other, trying to create a firework display of Christian power to please the masses ahead of the parliamentary vote. As the constant disk of those “bad Sunnis of Saudi Arabia attacking us poor Maronite minority in Lebanon” kept playing, some people were forgetting who was doing even worse than those Sunnis to the former patriarch Sfeir with insults that went from the belt down (“heida l batriark thayyaj” anyone? ), to attacking his tenure, his position, his seat and his person. But that doesn’t count – because it’s only bad when a non-Maronite does it apparently. You want to criticize the patriarch himself, as a person, fine by me. Feel free to criticize his political opinion, if any. Feel free to address his stance regarding social issues as much as you want. I think it’s healthy when religious figures are challenged in this country and no religious figure has probably been challenged as much as the Maronite patriarch, especially by his own people. But there’s a minimum required respect for the seat the man occupies. The Patriarch is but a temporary filler for the head of the Maronite Church. Calling the patriarchy a patriarchy of disgrace is not acceptable. Calling the Mass that took place in Syria as diabolical is unacceptable. I am not saying religious figures – as men – are the ones that should never be criticized despite everything. I’m saying that the institutions that these figures represent have a minimum of respect that should be given to them, regardless of where you stand when it comes to the matters of faith or lack thereof. When I read some Lebanese people calling the Maronite patriarchy a new prostitute for Al Assad, that to me – even as a non religious Maronite – is offensive because it not only attacks the patriarchy in its current form, it also attacks my forefathers of whom I cannot but be proud as they struggled through centuries of persecution against tyrants who were worse than Al Assad and I don’t mean this in the religious but in the historical sense. Insulting the Maronite Patriarchy and patriarch is not exclusive to one sect or one political side. Everyone does it and pretends as if it’s not okay to do it. What many seem not to realize is that there’s a thin line between being critical and downright insulting, especially when it comes to such institutions, that we cross way too readily, most often on a whim. Criticizing the Maronite Church’s practices is definitely not and should never be a taboo. And I’ll be the first one to criticize some of the policies they might come up with, something which I have done many times before. However, a few questions need to be asked: did the patriarch’s visit to Syria really cause any harm among the Maronites here or there? No. Did it bruise our pride? Perhaps it did. But is that reason enough to insult the patriarchy, the patriarch and enable publications from countries that do not even know the basic concept of freedom to do the same? I hardly think so.